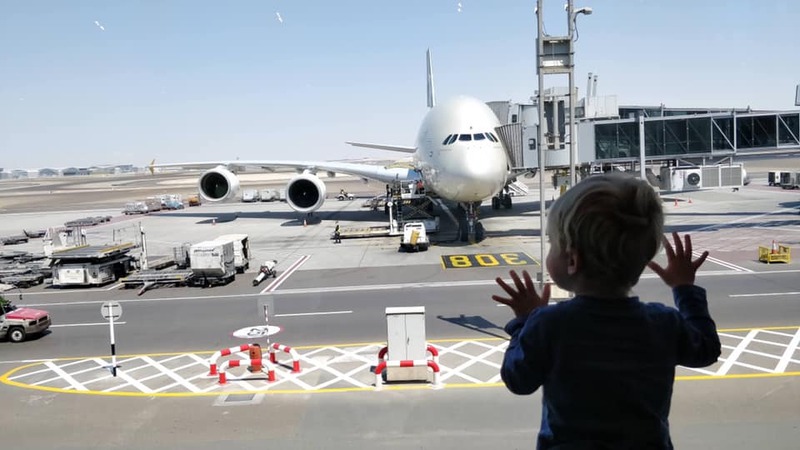 Face it–flying with a toddler on an airplane is daunting. Traveling with a baby seems easy in comparison. Toddlers are discovering (and demanding!) their independence and thinking about getting one to sit still in an airplane, car, or train for more than a few minutes might leave you sweating a bit. But traveling with a toddler is just like anything else in life. There may be a learning curve, but you can do it, and do it well, with just a little bit of preparation and practice!. 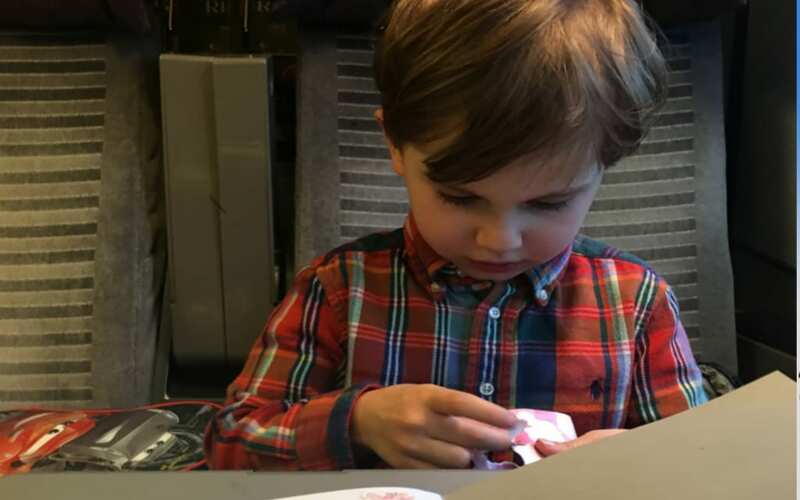 As keeping your child entertained is key to keeping him or her happy, I’m sharing with you a list of some entertainment tips that have worked when traveling with my two-year-old toddler. My daughter loves to play pretend. Felt characters are flat and lightweight, so they’re easy to pack and carry. If taking multiple sets of characters, separate the sets into individual plastic bags. We have princesses, a Peppa Pig family, Paw Patrol pups, the three little pigs, and a schoolhouse/transportation scene. *PRO TIP: Tuck an extra felt board set away in your luggage for the return trip so your child has something different to play with on the way home. Any stickers will work, but once your child is interested in a particular theme, those might keep his attention longer. We started out with different sized, neon-colored sticky notes from the Dollar store. Eventually, we worked our way to character-themed stickers. *PRO TIP: If flying, use a disposable placemat on the tray table. It makes it cleaner for your child to play on, but it also doubles as a place to stick all the stickers without worrying about defacing the plane! This may seem similar to the sticker tip, but good quality, repositionable sticker scenes keep an older toddler busy for longer than plain stickers. Regular stickers (or anything sticky) may keep a young toddler happy, but as one gets older, the sticker scenes are more entertaining. My daughter’s favorites are the Melissa & Doug Puffy Sticker Play Sets (safari, farm, pet store). Note that the Dollar store and Target often have reusable sticker sets for $1 or $3, but I’ve found that the stickiness barely lasts one position. So the $5 Melissa & Doug sets are a better investment as they last a lot longer. *PRO TIP: Save the plastic sleeve and tuck the sticker scene back into it when your child is done playing, and save it for a future travel day. My daughter only gets to play with these special stickers when we’re flying, and I rotate our collection so it feels like she’s playing with something new by the time one sticker scene rolls back into rotation. Window clings are gel-like, stretchy “stickers” for windows. They don’t adhere to anything but a window, although my daughter has had some luck getting them to stick on the plane entertainment screen. Stock up on these at the Target $1 spot every holiday when Target offers different and fun seasonal options. Don’t try to save these! Once they’ve been used, they’re gross. Just be happy your child got 10 minutes of play time out of them. Wikki Stix are wax-covered yarn that is moldable, with endless ways to interest a kid (or adult!). Also, these packets take up no space and are super lightweight. My daughter uses them to handcuff the criminals caught by her Paw Patrol pups, to create a harness for a horse or to build a staircase for the dolls to walk on. You might need to help your child at first, but once they get the idea, the possibilities are endless. Grab a small pencil or makeup bag and toss in a few miniature sized play-doh along and a few stamps. The bag keeps everything contained when not in use. *PRO TIP: Only take one or two. Packing too many will make your bag get heavy quickly. Find the small version of whatever your kids are interested in. In our case, it was initially Paw Patrol pups and Peppa Pig, then Disney Princesses and My Little Ponies, and now unicorns and fairies. The Dollar store occasionally has “blind bags” that serve a dual purpose–unwrapping a new surprise as well as the fun of playing with it afterward. Hallmark carries small stuffed toys called “itty bittys” in almost any character you can imagine. I only buy these when they’re on sale, which happens pretty often. *PRO TIP: A week before your trip, start preparing your child for the rigors of travel (“you’ll have to sit quietly on the plane,” “you must not kick the seats around you,” etc.) but also share that their good behavior may result in a few surprises. Then keep a couple of small items tucked away, wrapped in tissue paper, as a reward for good behavior. Figuring out how to stack the different sized nesting dolls is only one way to play or play with each of the characters separately. Oriental Trading Company often carries $5-sets of nesting dolls. If your child likes books, try to find lightweight paper or fabric books. Board books are too heavy, but Chick-Fil-A often adds interesting paper books to their kids’ meals. When you see these, stash them away for your next trip. For kids who will spend time coloring or painting, try carrying individual coloring sheets in a gallon zip-top plastic bag. The entire book gets too heavy. There are also paint books that only require water and a brush (Aqua Doodle; Water Wow) and markers that only work on a special page (Color Wonder). The twist up crayons are also nice for kids who will color a lot. Sometimes, a special blanket, either a favorite from home or a new fuzzy one, can help make your child comfortable enough to take a nap en route to your destination (or sleep on a red-eye). We started with a “blanket pal” which was a combined blanket and pillow. And while pink cheetah still accompanies us, I’ve found that a separate kids -ized travel pillow is more versatile than the combo. If your child will watch anything on the screen, it’s a good idea to bring toddler-sized (and volume-controlled) headphones. When my daughter was 2, it was hit or miss if she’d actually wear headphones or watch anything on a screen for more than a minute. But if you are lucky enough to be able to use that diversion, make sure to download some new shows that will be available offline. While shows wouldn’t keep my daughter’s attention, she would occasionally read books on the iPad. We use the FarFaria app, which has thousands of book options that will read aloud. Just “favorite” a book for it to be available offline. I’m not going to lie: my daughter hates wearing an eye mask. Getting shut off from all the mental stimulators is her idea of torture. But I made her practice wearing the eye mask for several days before our trip to get her used to it. And with enough of my husband’s persuasion, she accepted it and was able to nap in the middle of a busy and bright airport. Now I only have to threaten her with the eye mask to get her to voluntarily close her eyes long enough that she falls asleep without it. *PRO TIP: Talking to your toddler and explaining all of the new or different things he or she will experience during your travels will greatly enhance their ability to process those new things. By talking to my daughter in advance regarding the rigors of plane travel, I’ve been (lucky AND) able to avoid most problematic situations. In over 50 flights, she’s only had 1 meltdown, and that was at the very end of a 24-hour travel day and well past her bedtime. This has less to do with entertainment and more of my own personal obsession with keeping healthy while traveling. Thorough sanitation of the plane with antibacterial wipes (any surface that she or I might possibly touch) and adding the sticky disposable placemat to the tray tables keep away as many germs as possible. Despite getting sick every single time she goes to pre-school, my daughter has never gotten sick while traveling (knocking on wood, now). At two years old, my daughter was completely uninterested in anything on a screen. No games, cartoons or movies would keep her attention for more than one minute. She required lots of toys and crafts and other entertainment to keep her busy. At this age, I tried to stock my entertainment bag full of stuff that was disposable and very cheap, in case it rolled under the airplane seat never to be seen again. True story: I learned this lesson with a fairly expensive nesting doll set that went rolling down the aisle. After diving after it, furiously crawling around the plane aisle on my hands and knees, and finally realizing it was lost forever, I vowed to only pack cheap and disposable items in the future. I am a crazy person who carries an under the seat sized rolling suitcase filled with entertainment, snacks, water bottle, changes of clothes, pillow and blanket (if a long flight), anti-bacterial wipes, tray table covers, and diapers. On long haul flights, I pull it out from under the seat and sit it up between my daughter’s seat and the seat in front, cover it with the blanket, and it’s similar to an inflatable footrest by creating a surface for my daughter to stretch out. This bag of tricks saves my sanity (and those around us—because my daughter is almost always happy), and it’s worth lugging around. It also serves as entertainment at our destination. Don’t be daunted by the idea of traveling with a toddler. With enough activities and snacks, most toddlers are perfectly happy just hanging with their parent. Happy (and entertaining) travels!